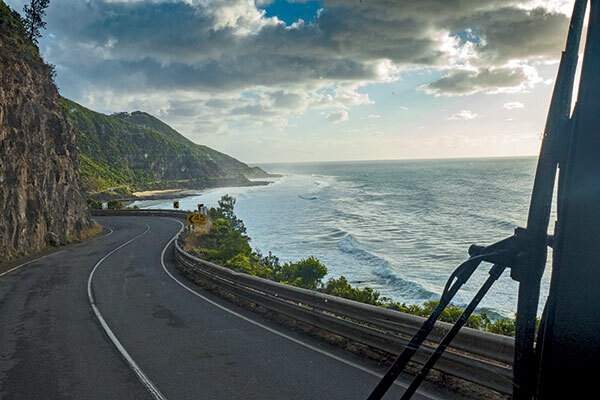 Trevor sits contentedly outside his motorhome by the side of Wye River, down the valley from the Great Ocean Road, Vic. 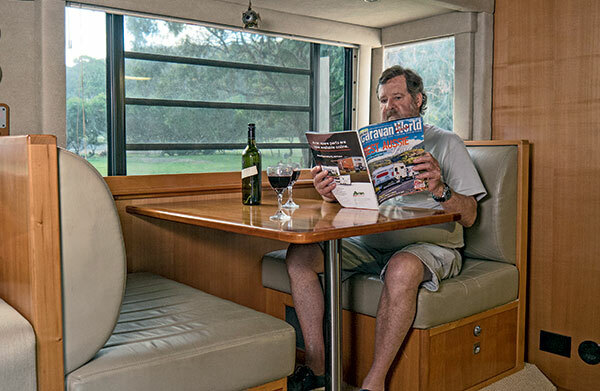 Kookaburras cackle as he sips red wine from a wine glass bought by his late wife Julie, who gave this motorhome its homely touches. Julie was diagnosed with breast cancer in 2001, so the duo decided a change of scenery was in order. They borrowed a friend’s Toyota Coaster, loved the experience and the wheels were set in motion for their own motorhome. 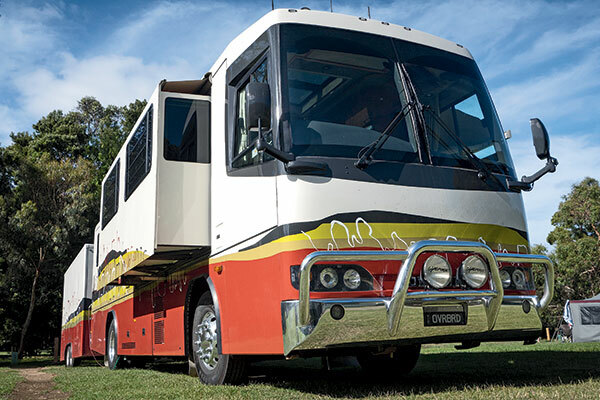 The chassis was custom-built by Denning in Queensland and the fit-out completed by Jacana in New South Wales. They set no limitations on the build and, when it was completed in 2006, it was 11.58m (38ft) long with a GVM of 18 tonnes. Behind the motorhome sits a box trailer housing a Subaru Forester and a 4.2m Quintrex tinnie, along with more gear than most Australian homes have stashed in their garage! When completed, Trevor ordered the number plates ‘OVRBRD’, a nod to his unashamed passion for modifications and creature comforts. Power comes from an ISL 8.9L Cummins dishing out 400hp with mountains of torque, ideal for overtaking road trains on bad roads. It’s mated to a five-speed gearbox. The maximum speed of 100km (restricted) is achievable on almost any incline, says Trevor, who has a hankering for horsepower, having previously owned a 500hp Robnell Cobra and turbo Porsches. But he rates his bus even more fun. Arriving at the camping ground, Trevor lowers four self-levelling jacks then slides out the main bedroom and separate salon area. All up, there’s about 30 square metres of internal space comprising an office and dinette area, kitchen with double-bowl sink, automatic dishwasher, gas oven, three-piece hotplate and wok burner. Trevor designed the internal stainless-steel fridge himself with sliding drawers and compartments to suit life on the road. Trevor started out as a plumber, but his career evolved into engineering, working on earthmoving equipment for Telecom (Telstra). His handiwork has been utilised on his own homes, cars and boats, and was put to good use on the motorhome. He custom-built the barbecue slide-out featuring instant hot and cold water, a drinking fountain and a sink wrapped around a Weber Summit barbecue adjoining an Auto eutectic fridge. 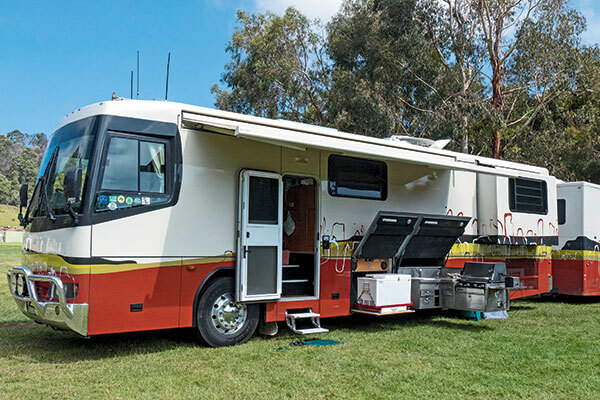 It’s where Trevor spends most of his time, happily boiling up lobsters, roasting a leg of lamb or flipping a barramundi he’s caught out of the tinnie sitting in the trailer. He can also fry wontons in the wok burner – yes, he can cook Chinese and has a certificate to prove it. The handiwork extends to the box trailer designed and built by Trevor with a GMV of 4.5 tonne. It encloses the Forester, with the tinnie and 40hp Yamaha four-stroke engine fitted above that. 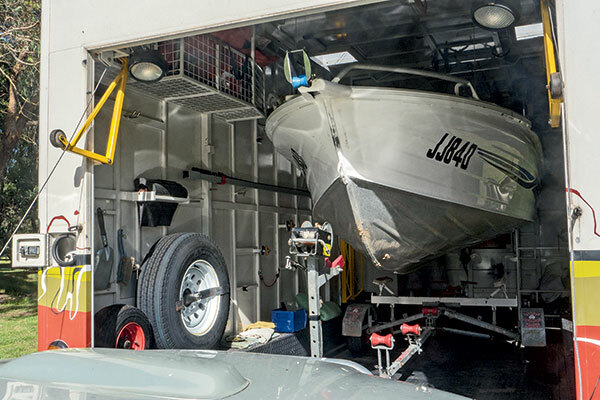 When the car is reversed down the electrically operated ramp, a Bulldog trailer is assembled below the boat. It’s then (electric) winched down onto the trailer and driven out of the enclosed trailer. The ‘rear garage’ also holds two bikes, tools, workbench and vice, and fishing and camping gear for sojourns off the beaten track. 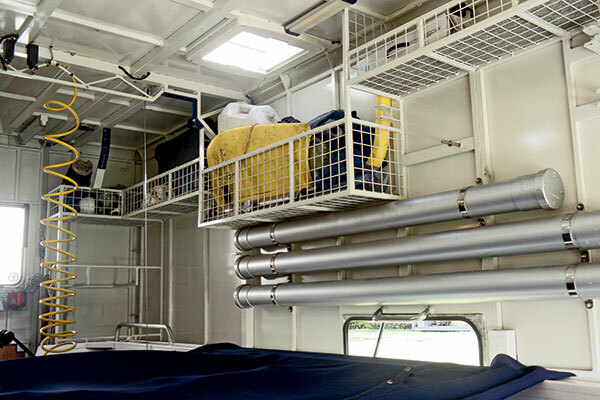 The motorhome features a 5kVA generator that can power everything simultaneously, if needs be. It also hosts six solar panels on the roof, a 4000W inverter, 200L of filtered drinking water and 600L of potable water. The motorhome’s exterior paintwork is inspired by ‘Scribbly Bark’, a painting by Fred Williams who specialised in outback landscapes. 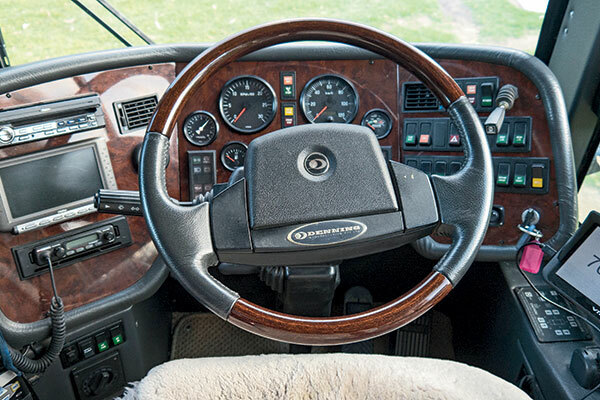 Natural finishes appear throughout the motorhome including Corian benchtops and marine-themed teak flooring. The cupboards are constructed of high-grade marine ply and finished in American cherry veneer. Barry Drury from Jacana, who fitted out the motorhome, insisted on high-grade marine ply instead of MDF or chipboard. He believes marine ply is far more durable and will hold screws irrespective of wear, tear and vibration. Marine-grade ply is also far more water-resistant. When Trevor and Julie travelled as a pair, their favourite form of camping was self-contained free camping. Whenever Julie got out of hospital after a treatment, she’d ask, “Where are we off to?” Darwin was a favourite location, the couple completing five trips through the Red Centre. Ningaloo Reef was another popular destination, and they travelled there three times. Trevor’s favourite waterhole is Ashburton River in the Pilbara region of Western Australia. 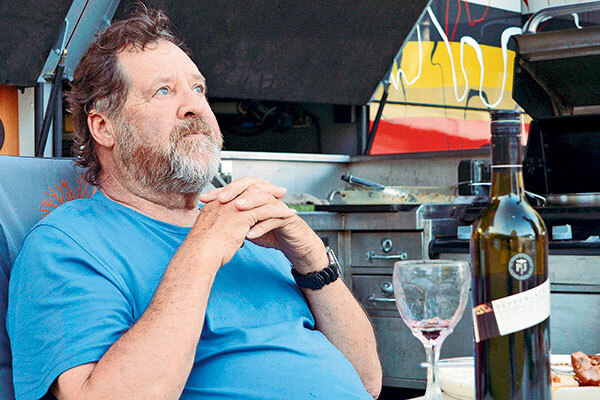 He gave the outdoor Weber a good working over with a steady supply of fresh mud crabs, barramundi, bream and the king mullet unique to that part of Australia. Trevor admits that life without Julie, who passed away in 2014, has been hard. There are constant reminders of their life together, and her input into the motorhome. But he’s made some lifetime friends along the way who he still keeps in touch with. 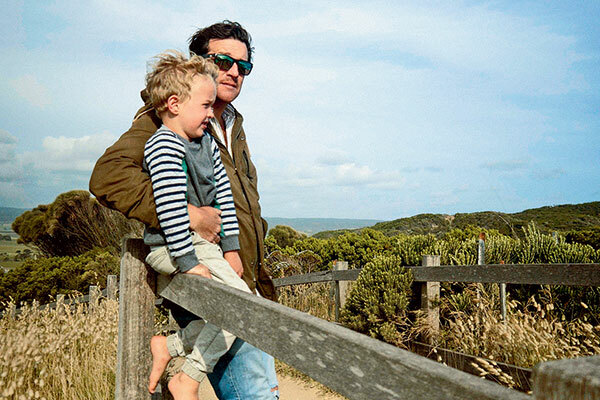 His family are keen to share in the experience and when we caught up with Trevor at Wye River he was accompanied by his son Travis and grandson William. They were creating stories for Travis’ magazine, The Captain. Fishing paraphernalia was strewn around the motorhome – whiting rods in the boat, diving gear in the shower and fresh kingfish and lobster in the fridge. 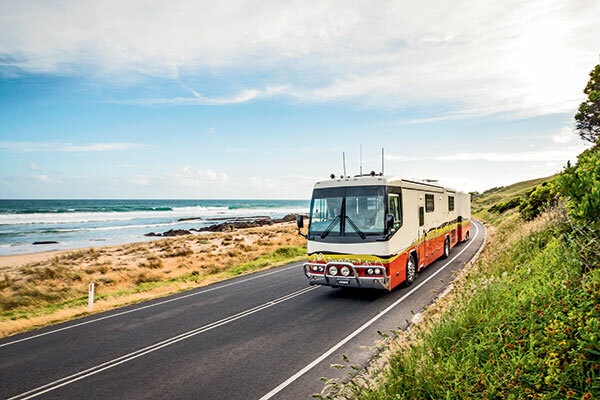 After more than 10 years dividing his time between his Carrum Downs factory in south-east Victoria and being on the road, Trevor concedes he’d like to sell up and move on to something else. Whatever that is, we’re pretty sure it’ll be a head-turner.